I have the good fortune of being able to participate in the bee health survey being conducted in the U.S. by BeeInformed.org. The survey is following 8 hives in 25 apiaries from June to November. Bees suspended in alcohol samples from each hive are being analyzed by The vanEnglesorp Lab, in Maryland, for general health with particular emphasis on varroa mites and nosema. When I responded to the offer back in June, I thought I wouldn’t be eligible because I don’t open my hives in November. We can be under snow by then. If not snow, I can guarantee it will be very cold and very wet. Happily, BeeInformed.org replied that I could participate, and simply let them know when the weather was too horrid to open the hives. Each beekeeper got to choose which eight of their hives to survey. I chose to use hives in one of my breeding bee yards. These hives provide the queens that supply eggs for my queen rearing and the queens who produce the drones with whom the virgin queens mate. Of the eight hives I chose, four hives were descended from queens I raised and four hives descended from queens from a local, queen breeder Northwest Queens (Arlington, Washington). Both of us focus on breeding bees adapted for our wet, cold environment, in naturally treated hives. 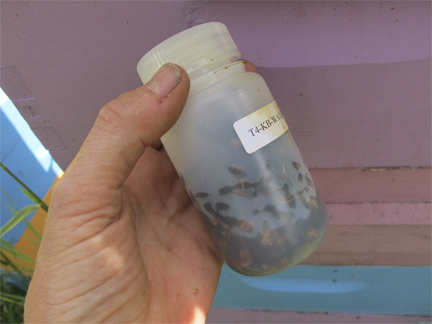 One of the chosen hives descended from my queens is the “Non-Infected Hive” that is part of the “phages that may kill American Foul Brood” field test from Penny Amy and Diane Yost of the University of Nevada, Los Vegas. This hive does not have AFB, but is being treated with the same phages being used on infected hives. The treatment will most likely have no effect on the hive, but all information is good information, in my humble opinion. Four of the chosen hives (but not the above hive) are taking part in another smaller experiment with Stratiolaelaps mites. These mites eat varroa. The number of STRATS needed and their efficiency on infected hives is still being studied. The four hives ranges from low mite counts to one hive with very high (1 mite for every 10 bees sampled) mite count. 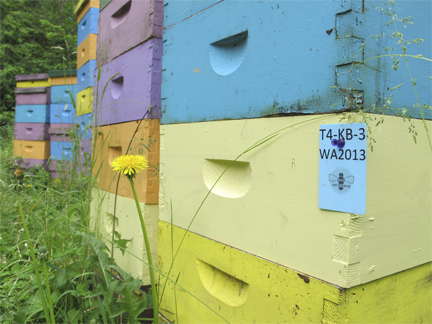 In four weeks these hives will be tested again in the survey, which will provide a bit of data. 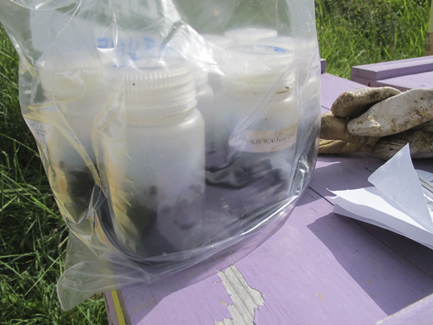 6 monthly forms to fill out that ask for observations on diseases, parasites, treatments odd occurrences, what actions were taken with the hive (splits, pollination, movements), and any unusual external pressures on the hive (In June, it was pouring rain. By July we had weeks of 80F degree weather. The former is normal; the latter is unusual). In the middle of each month, I go out to each of the tagged hives. I open them, pulling off boxes until I reach the largest brood area. I do not use queen excluders, so brood can be where ever the queen and her handlers figure she should lay. But usually the main brood chambers are in the second and third box (I use only mediums). I choose 2 frames with brood and nurse bees, being very careful to check that there is no queen present. These 2 frames are then shook into a deep plastic tote. Foragers fly out; nurse bees stay. Well, they start to crawl out, but it’s a long way up and the walls are plastic. I take one last look for the queen (worry is my middle name), then scoop two ¼ cups of bees and put them into the funnel that is inserted into the alcohol containers. I do say, “To those who are about to die, I salute you.” I do feel a bit bad. However I see the hive as an entity, not each individual bee. Thus this is something like a biopsy on a person. Some components die to assess the health of the hive, and hopefully provide some information to other beekeepers though the survey. So far I have done two of the samplings, June and July. June’s results are back. July’s expected in a few weeks. It will be interesting for me to see he progression of these 8 hives though the year. It’s a luxury I don’t normally have. 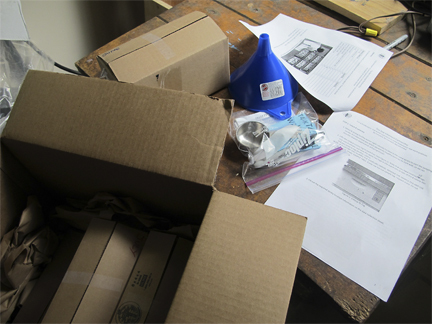 Merging the other experiments into the monthly lab tests will be equally interesting. Hopefully my results and the results of the other beekeepers participating in the survey will provide some useful information to other beekeepers. In the end, I must admit it is fun. That’s what I like about beekeeping: it’s science, nature, art, and just plain luck all rolled into one. I’ve been luck enough to find another bee yard within breeding distance from home, and have been preparing that – from power scythes to solar panel. Making and wiring frames. Hanging wax. Doing markets. So it’s been busy. 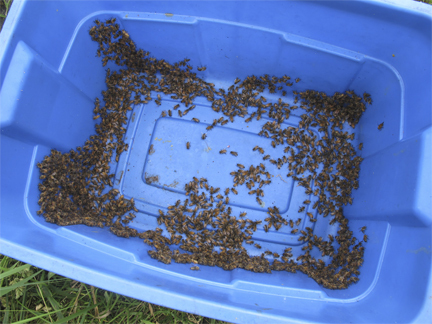 What’s happening in your bee yards these days? This entry was posted in Beekeeping, Brookfield Farm Bee Yards, Diseases and Pests and tagged bee, beeinformed.org, Beekeeping, diseases, health, honeybees, Maple Falls, survey, Washington. Bookmark the permalink.